If you have enjoyed your time and wish to continue to work with us please feel free to register at the top right of our website. We do not submit any contact information to 3rd party sources. We use this information to stay better informed and in constant contact with our clients. Please email your resume toinfo@HarrisRealEstateTeam.com and someone will contact you based upon your qualifications. Working with our team is considerably different from working in a traditional real estate office. We think you will find the difference refreshing and rewarding. Traditional real estate brokers typically look to their agents to generate listings and sales. The broker recruits experienced agents from competitors and new agents from the general public or real estate schools. The experienced agents are appealing because they will hopefully bring with them a network of referral and repeat business. The fact that they are already trained is also a plus. The new agents, while requiring training and nurturing, are appealing to the traditional broker as they open the door to their "sphere of influence." This means their contact with friends, relatives, and acquaintances could bring more business. They hopefully also bring enthusiasm and a willingness to prospect for sellers and buyers. In summary, the traditional brokers rely heavily on their agents to drive the business in the door. Our concept is just the opposite. We believe that our concept needs to be strong enough to attract the business. We do not rely on agents to do the marketing of our concept. The broker/owner handles that aspect. While our competitive marketing programs attract business, we still need to get the message out to the consumers. We depend on our agents to provide the professional skills necessary to service the business we generate. Our team of agents focus their efforts and energy on helping the buyers and sellers. By offering home sellers superior marketing along with a high sales ratio, they are attracted to The Harris Real Estate Team. At our office, agents have plenty of opportunities to get face-to-face with sellers and buyers. Our team of agents spend most of their time helping sellers and buyers, NOT prospecting. You'll also find that when you offer the best services in town - they appreciate it. The relationship changes from adversarial to appreciative. How Do Agents Make Money in a Challenging Market? Simple, Our agents may more due to the exposure and influence of our team; however, our agents typically have more closings than the average agent. Our agents also do not have to spend their money on advertising, and supplies. End result - our agents make more. There's More Than Money At Stake! While most of our agents make above average incomes, money is not the only motivator. Quality of life is an important issue. When you work in an environment where you have more than enough business, the relationship between fellow agents in your office becomes less competitive and more collaborative. A true TEAM environment evolves. Everyone works together to deliver the best service for the sellers and buyers. We call it a "sense of community." Working Together Everyone Achieves More. Not many real estate offices can make this claim. In which environment would you rather work? 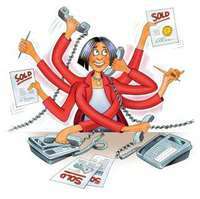 Harris Real Estate Team agents are very busy. The best part is they are busy working with buyers and sellers, not searching for them. Typically our office will generate many more times the leads as other offices. The average agent on our team will handle ten times the business than the average agent. You're surrounded by top Producers, and the best part is you'll become a top producer as well! It Is a Full Time Commitment! There's too much at stake for the consumer to turn the sale of their home over to part-time agents. The good news is that, on the Harris Real Estate Team, you'll be successful enough to make real estate your full-time career. Your skills will improve faster with the experience and guidance and you'll enjoy from Bruce and Tara. Some real estate agents are content with closing a few sales per year, making enough money, and not working too hard. These agents would not be happy and don't belong on our team. Ours is a fast-paced, demanding, challenging world. Where do you see yourself fitting in? Call Us Today at (727)384-8272 for more details or [Click Here] to send your resume.